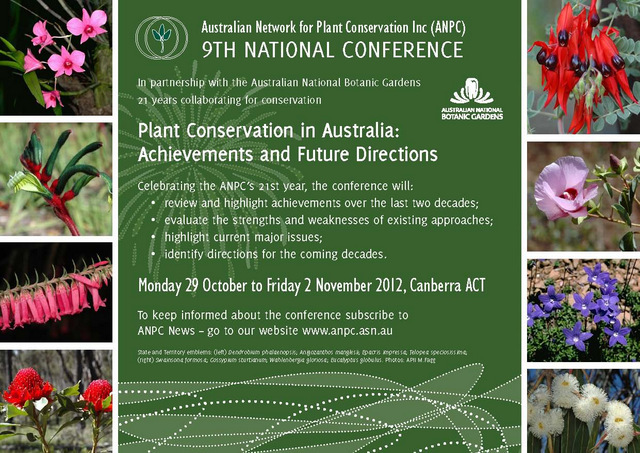 The Australian Network for Plant Conservation (ANPC) is celebrating 21 years of promoting and developing plant conservation. To mark the occasion we've released a list of 21 of Australia’s most threatened plants. The list is being launched today on National Threatened Species Day. National Threatened Species Day is held on 7 September each year - commemorating the death of the last Tasmanian tiger at Hobart Zoo in 1936. More than 40 Australian Plant Species have become extinct since European settlement and over 1000 species are currently considered likely to become extinct within our lifetime unless something is done to reverse their decline. Help raise awareness of Australia’s unique and threatened flora by sharing this list among your friends and networks. Make sure you click-on 'show info' in the top right corner to see the text. The slide show is best viewed at full screen (select the box with four arrows in the bottom right). What species do you think should have made the list? We've turned on comments at ANPC NEWS so you can leave a comment under this post or leave a comment on our facebook page. 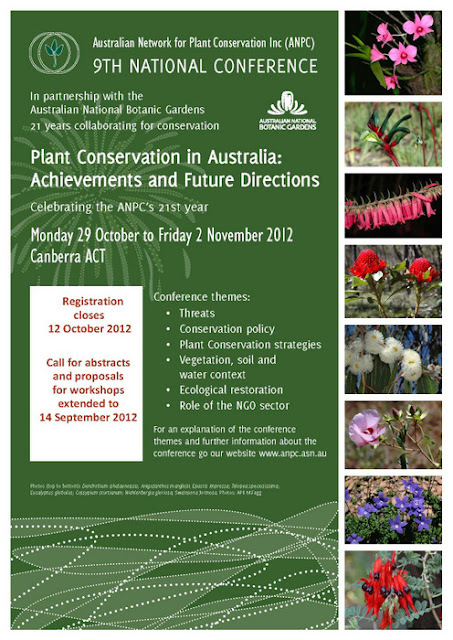 The ANPC is hosting its 9th National Conference in Canberra 29 Oct - 2 Nov 2012 on the theme Plant Conservation in Australia: Achievements & Future Directions. 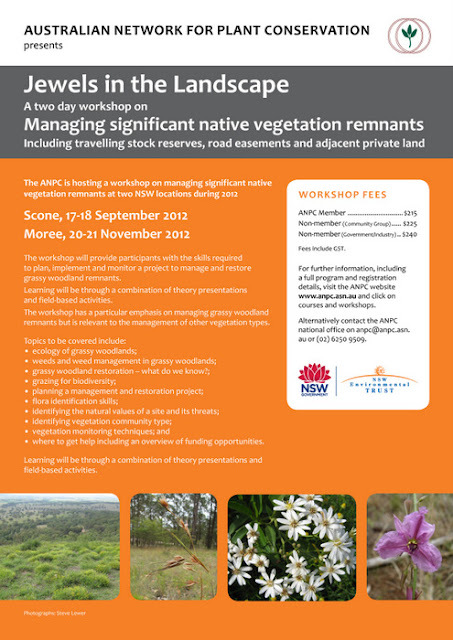 We also have five upcoming workshops on topics covering the identification, management and restoration of native vegetation. The call for abstracts and workshop proposals for ANPC’s 9th national Conference has been extended until 14 September 2012. 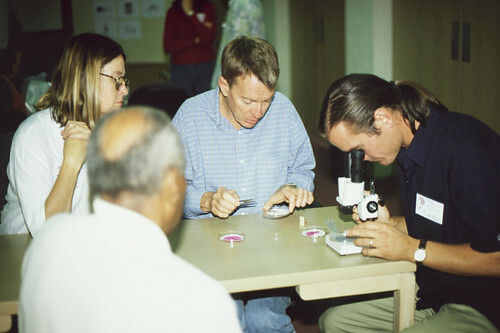 The conference webpage was recently updated to include details for the field trips. Grassland and Woodlands. Fri 2nd Nov. This tour will visit numerous sites across ACT and NSW where threatened flora are actively being managed, including Old Cooma Common, Kuma Nature Reserve, Scottsdale, and Royalla Swainsona Reserve. Brindabella Ranges. Fri 2nd Nov. Includes a tour of the Ginini Ramsar wetlands, post-fire vegetation recovery and the Yass River Renewal program. Kosciuszko National Park. 2 – 3rd Nov. This tour of spectacular Kosciuszko National Park will visit a range of habitat restoration sites including for Spagnum bog and Tall Wallaby Grass. Registration closes 12 October 2012. 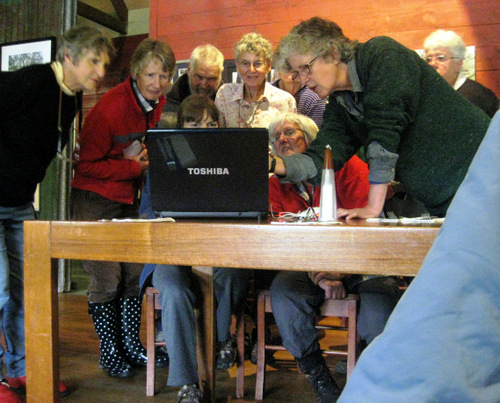 The Australian Network for Plant Conservation is embracing social media in our efforts to promote and develop plant conservation. You’ll now find us sharing plant conservation news on Facebook, Twitter, and Google +. This two day workshop will provide participants with the skills required to plan, implement and monitor a project to manage and restore grassy woodland remnants. 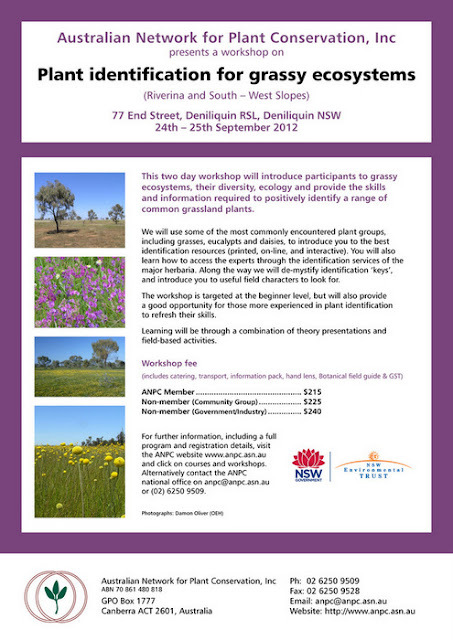 The Australian Network for Plant Conservation is hosting a workshop on Plant identification for grassy ecosystems (Riverina and South – West Slopes) 24th - 25th September 2012 in Deniliquin NSW. For more information, including a full program, flyer and registration form please visit workshop webpage. 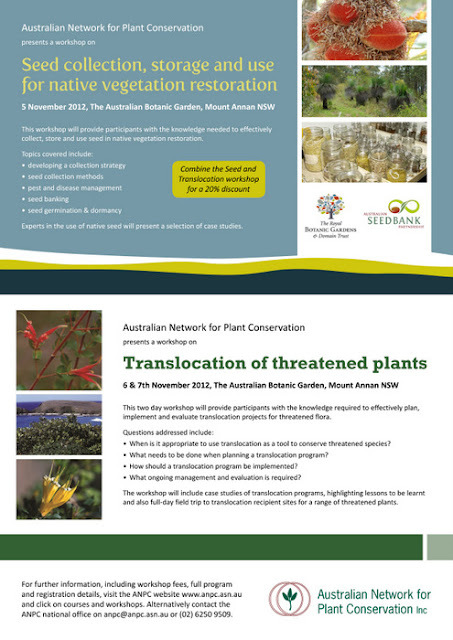 The Australian Network for Plant Conservation is hosting a workshop on Seed collection, storage and use for native vegetation restoration 5 November 2012 at the The Australian Botanic Garden, Mount Annan NSW. ANPC members recently received issue 21 (1) of Australasian Plant Conservation. The theme of the latest issue is bushland restoration. 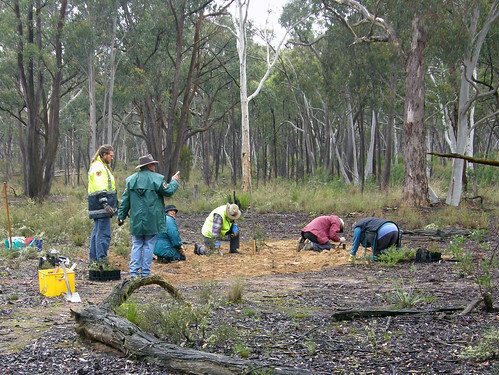 The issue examines current small scale efforts and local approaches being made in the restoration of bushland areas. The south-east Queensland ecological restoration framework – the ‘how to guide’ for a biodiversity hotspot by David Francis, Rhonda James and Darren McPherson. The next issue will expand on this to examine restoration at a larger, landscape scale. Applications are now open for the NRM Climate Change Impacts and Adaptation Research Grants Program (Impacts and Adaptation Grants Program). The closing date for applications is 2pm AEST, 27 September 2012. The Impacts and Adaptation Grants Program is part of Stream 2 of the Regional NRM Planning for Climate Change Fund, which has been developed as part of the Australian Government’s Clean Energy Future plan. This merit-based grants program will provide $8 million in funding over four financial years to research institutions to work with regional NRM organisations to deliver information on climate change, its impacts and adaptation responses, and provide guidance on how to use that information. Expressions of interest (EOIs) are being sought from public land managers in the Sydney Basin. 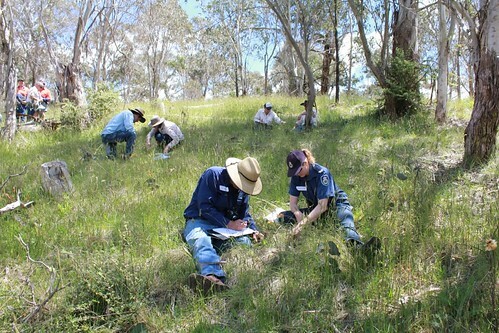 For more information visit: http://www.environment.nsw.gov.au/conservationprograms/linkinglandscapes.htm. Doug Benson and Lotte von Richter from the Royal Botanic Gardens and Domain Trust have prepared a web site dedicated to the Plants of the Newnes Plateau. About 590 native plant species have been recorded on the Newnes Plateau in the upper Blue Mountains and its special vegetation includes the nationally listed Newnes Plateau Shrub Swamps Endangered Ecological Community and other rare or threatened plants and animals. The pages provide information on many of the interesting plants and vegetation communities of the plateau as well as information on ecology and history. 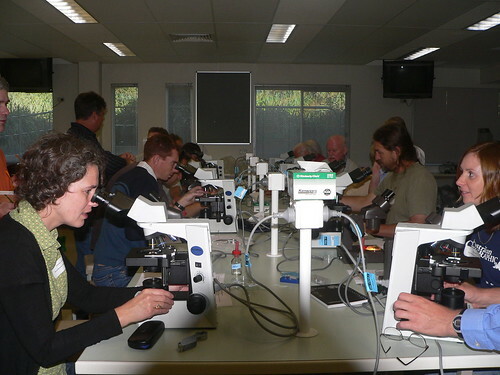 The proceedings of recent forum held by the Royal Zoological Society of NSW, Wildlife & Climate Change: Towards robust conservation strategies for Australian fauna, are now available online. Several of the chapters are relevant for terrestrial and aquatic flora/vegetation as well as for fauna. For example Lesley Hughes asks 'Can Australian biodiversity adapt to climate change? and Tony Popic and Glenda Wardle explore 'Extremes: understanding flower-visitor interactions in a changing climate'. The full publication can be downloaded for free here. This illustrated booklet is designed to assist land managers, owners and occupiers as well as environmental assessment officers, consultants and the general public to identify, assess and manage the Grey Box (Eucalyptus microcarpa) Grassy Woodlands and Derived Native Grasslands of South-Eastern Australia. This nationally threatened ecological community is listed under Australia's national environment law, the Environment Protection and Biodiversity Conservation Act 1999 (EPBC Act). This paper summarizes a decade of plant eradication attempts by the New Zealand Department of Conservation. Data on 111 environmental weed eradication programs have been collected and summarized. Botanic Gardens Australia and New Zealand Inc (BGANZ), the chief body representing the interests of botanic gardens in Australia and New Zealand, is holding its annual conference on the Sunshine Coast Qld 6 -7 Sepetmber 2012. Details here. Join the National Parks Association (Hunter Branch) for a slow walk though the late spring wildflowers of the coastal heath of Awabakal Nature Reserve. For more information phone Maree 0410405815 or John 0400882897. A Serrated Tussock field day will be held at "Brucedale" Peel NSW 10th September 2012 to explore new technologies for an old weed. The informative and practical day is aimed at land managers, Weeds Officers and other weed professionals. The NCC Annual Conference is an opportunity for member groups to gather from across the state and formulate council policy. Further details here. 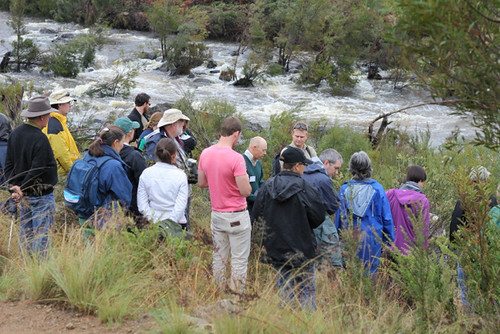 The inaugural Society for Ecological Restoration Australasia Conference, 28-30 November 2012 in Perth, Western Australia is shaping up to being an exciting and inspiring meeting, with seven keynote speakers now announced.